The 21cm Clamp Lamp is fitted with a heat resistant, ceramic lamp holder designed specifically for prolonged use. The lamp is multi directional and has a heavy gauge, highly reflective aluminum dome to concentrate the heat and UV rays towards your tortoise. The lamp also comes with a detachable protective mesh covering. The Trixie 100watt UV and basking Bulb provides a high output of UVB/UVA which is essential to any and all tortoise’s health and well being. A UV source of this high standard, combined with a healthy fresh diet of weeds and flowers, will prevent disease such as Metabolic Bone Disease. 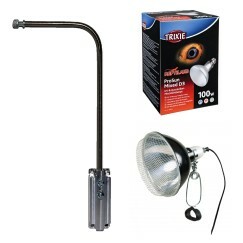 After many years working alongside the market leaders in reptile lighting, we decided to create our own. We worked closely with a local engineering company ( Ideal Engineering UK ) to create the perfect bracket to accommodate the Arcadia clamp lamp system. This NEW product can be universally fitted to any of our tortoise tables old and new. 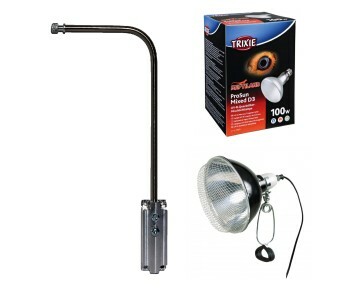 The large is designed for the Trixie 21cm clamp and 100 watt bulb.